Ceder Rapids, IA - Back in Iowa as a full-fledged presidential candidate, Democrat Elizabeth Warren took aim at President Donald Trump on Sunday, saying he “may not even be a free person” by next year’s election. The Massachusetts senator has largely avoided talking about Trump since she began testing the waters for a campaign more than a month ago. 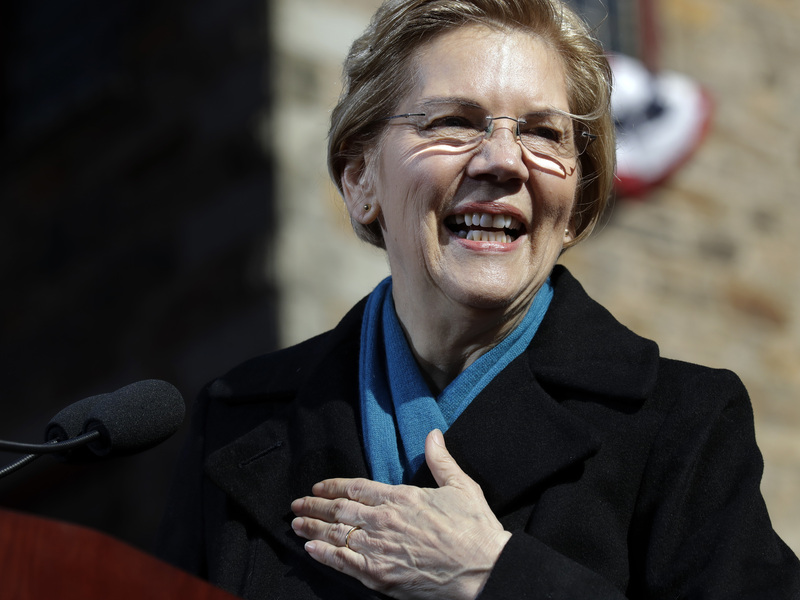 She’s been a frequent target of the president, who has criticized her past claims to Native American heritage, including in a tweet Saturday night. During a campaign event in eastern Iowa, Warren said the 2020 campaign shouldn’t be dominated by Trump’s frequent attacks. Warren didn’t explain her comment, though she appeared to be referring to the multiple investigations that have shadowed Trump’s presidency. Trump has not been charged with any crimes, but several of his former advisers have been pleaded guilty to a variety of charges. There’s an item missing in the picture, the broom she flew in with. Sorry but standard practice is not to lock up or indict a sitting president. Too bad pochahantis but the man is above the law. Remember when you guys said he ain't gona last more than two years? Lol! Delusional wishful thinking. If Mueller investigation is any indication, justice in Washington moves very slowly. If anything substantive on the President had been unearthed, it would have been leaked long ago. The left is bankrupt of ideas other than that of class warfare and socialistic wealth redistribution. Nihilism is not an attractive ruling option. She has zero chance and is already doing everything poorly. “ Sorry but standard practice is not to lock up or indict a sitting president. Too bad pochahantis but the man is above the law. Smart move from her. Its classier than Lock Him Up. "Standard Practice" is irrelevant to her base just like it was for Trump. "Lock her up" without a single charge, trial, conviction, sentensing is NOT STANDARD PRACTICE in the USA. "She has zero chance" Its even a better reason to charge up the Dem Base. Nothing to loose. Lock her up got Trump millions of votes. Lock him up will get the same for the Dems. The Reps dont have an Exculsive on Meshugayim. Plenty dems are the same. Standard Practice is not the Law. Indicting a sitting President is perfectly LEGAL. "Lock Her up" without any charge is against the law. It does help you elected. She had a GREAT teacher. Trump must present Pocahontas with a broom, with the seal of the Presidency on it. Hence, when she campaigns, the voters will realize that in addition to someone who claimed to be an American Indian, they will also be able to add witch to her resume.